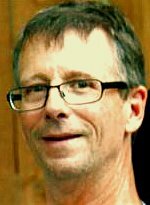 CEDAR FALLS, IOWA - Mark J. Arends, 58, of Cedar Falls, died Friday, August 21, 2015 at Covenant Medical Center in Waterloo. He was born March 17, 1957, in Cedar Falls, Iowa, the son of John and Mildred Hermansen Arends. He married Michele Olson, March 21, 1987, in Cedar Falls. Mark graduated from Cedar Falls High School in 1975, and was employed as a welder/fabricator at Bruns Machine in Cedar Falls. He was a member of the NRA. Mark was survived by wife of Cedar Falls; children, Megan Arends of Babbit, Minnesota, Justin (Samantha) of Oakdale, Minnesota, Mardith (Clint) DeGroote of New Hartford, Iowa, Jodi (Mike) Morse of Readlyn, Iowa, Marcus of Eugene, Oregon, and Nic of Ames; ten grandchildren; and his brother Ron (Janet) of Brooklyn, Iowa. Visitation will be Tuesday at Richardson Funeral Service. A private interment will take place at Fairview Cemetery on Wednesday.